Car owners. Between the sea and the mountains, 10 minutes from Ribadesella and beaches. In a leafy hillside above the Sella River valley and watching the Picos de Europa is Toraño Palace. 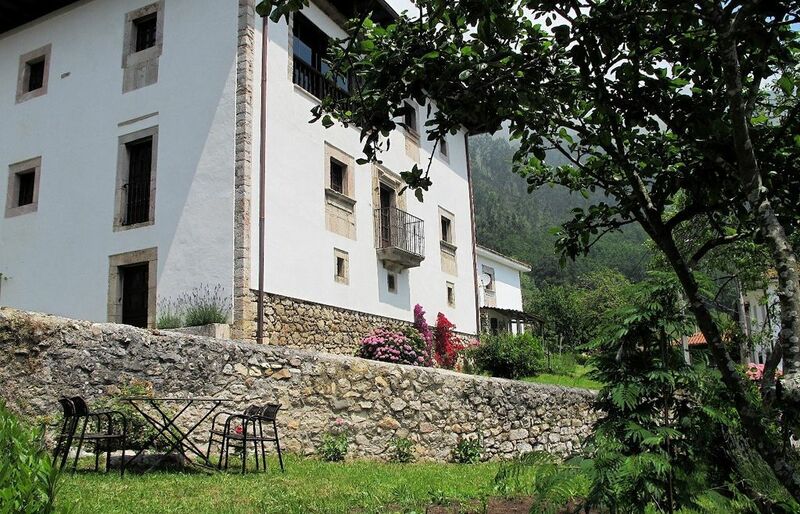 Located in the quiet town Torano and one of the most beautiful and unspoiled councils in Eastern Asturias. Full and ideal capacity for 8 people rental, has over 300 m² divided into four bedrooms, each with its own bathroom. The 50-meter living room has a fireplace. Independent kitchen. Incredible views from the large corridor to the mountain and the river sealed. Parking for three cars, garden and granary. Pets admitted under specific request and depending on size and behavior. Pets under express request and according to size and behavior. 5 euros night. Cradle. We enjoyed our stay. The house is lovely with beautiful views. We did have to get used to no doors on the bathrooms. Marta and Isabel were very helpful with restaurant suggestions. The bridge and road that you drive to get to the house are very narrow, which was a little scary, especially the first time you drive it. We were a little nervous about driving it in the dark, but we did get used to it. The house location was very conveniently located for all the areas we were visiting. Great trip! We just spent a week in this lovely place. We were four adults and had more space than we needed really. It is located in the tiny hamlet of Toraño. The upstairs where most of the bedrooms are located, has a sitting area with a panoramic view of the mountains, river, and parts of the village. It was ideally located for visits to all of the surrounding area and we made many excursions. Isabel and Marta were very helpful with directions and suggestions. We would recommend it as a wonderful base for Asturias. We had a wonderful holiday at Torano Palacio. The house is really beautifully decorated and has fantastic views of the mountains and river. There was everything we needed for a comfortable stay including a well equipped kitchen. Despite our terrible Spanish, we had a very warm welcome from Pili in the village and Marta and Isobel were really helpful with tips on local restaurants and places. The location of the house is perfect for accessing both the coast and the mountains. We had a great time exploring the many gorgeous coves and beaches and enjoyed going up into the mountains to walk and eat cheese! We kayaked down the River Sella which was great fun. Ribadesella, Llanes, Cangas and Arriondes were all easily reached and we enjoyed trying local dishes. Thank you Isobel and Marta for sharing your beautiful house with us, we loved it. You have been more than good to us, everything has been easy with you and we hope you come another time. It is very grateful to know that you (as we do) like our house and Asturias, that encourages us very much. We (my husband, two boys and I) were lucky enough to spend ten blissful weeks here. It was the perfect "get away from it all" location but also not too far from the nearby towns of Ribidasella and Arriondas. The house was absolutely amazing. It has been so lovingly restored by Isabel and Marta. We felt really privileged to stay there. The photos online just don't do it just. The house is very comfortable and convenient while also maintaining its old world charm. The views of the mountains and river Sella were spectacular. The upstairs sitting room has a massive window was an ideal spot to gaze out at the views. There was lots to keep our three year old entertained with (playing on the beach at the river, exploring the hills and Forrest's behind the house and of course going to the wonderful beaches near by. Food in the area is also fantastic and great value. Marta, Isabel and Pillar could not have been more helpful either. It really became home and way from home and we'd definitely like to return one day to this magical place. The Palacio is lovely...it was more beautiful than the photos! We spent a wonderful week at the Casona Asturias. We were welcomed by Pili, who attends to the property, and although we speak limited Spanish and she spoke no English, we were able to communicate well. She was delightful in explaining all of the amenities of the house and kitchen. The house was emaculate with fresh hydrangea in vases in many of the rooms. The casona was spacious and eclectically decorated. We love to cook, and found the kitchen to be well appointed. There was even a dishwasher! Additionally, there was a new washer and dryer in the laundry room, plus an indoor clothesline for delicates. The most stunning room is the sitting room off of the master bedroom. The view is outstanding and we had many lovely evenings sharing wine and watching the kayaks on the river below.The location of Palacio is perfect. We were close to many interesting and fun small towns and beautiful beaches. We enjoyed kayaking on the river and hiking nearby. There were a variety of restaurants to chose from very close to the small village of Torano as well. Isabel and Marta have a book with their favorites (including menus and directions). Isabel and Marta were so gracious as to stop by on our last day to offer us some great restaurant recommendations in San Sebastian where we were next headed. We often rent homes in the countries we visit and this was an exceptional experience. We look forward to returning and bringing friends and family! Thank you indeed Scott and Marjorie. We try always to do our best, and commentarys like yours encourages us to keep on with our work. We must say that you were wonderful guests! Hope we see you again whenever you want. Un paraíso. Todo genial, la casa muy bonita y muy cómoda. Cerca de todo, rio, playa, montaña.! Perfecto! Un paraíso. La casa fantástica. Torano Palace, renovated in spring 2011, built in 1701 and belonged to an abbot of Covadonga is located in the quiet town Torano: and one of the most beautiful and unspoiled councils in Eastern Asturias, Picos de Europa . In the valley of Sella, between Ribadesella and Arriondas and very close to Cangas de Onis, Covadonga, Senda del Cares, Llanes, Fuente De. The situation is unique, it is also an area that retains a rich and varied fauna. Rural tourism enthusiasts can experience farming and livestock tasks performed in the villages of Asturias. And taste the most typical dishes of Asturias (stew, rice milk, wild boar, goat) Activities: Hiking, Climbing, Fishing River, Canoeing, Mountain Bike. The area has excellent communications and access to all major points of interest of the east and center of Asturias. Golf: There are three golf courses just 50 kilometers from the Villa. Ski: Three ski resorts within 50 kilometers Torano. Holy Week, minimum 4 nights. Prices Bridges as in high season. 5 euros per night per dog. A deposit of 20% of the fee is asked, this will be confirmed with booking. It will also be the deposit which is due on the last day if the house is in the same conditions on the first day. Bookings less than one week, 400 deposit. A week before 100% satisfied. 5 euros noche por perro. Puentes precio como temporada alta, Semana Santa, Navidad o Verano.